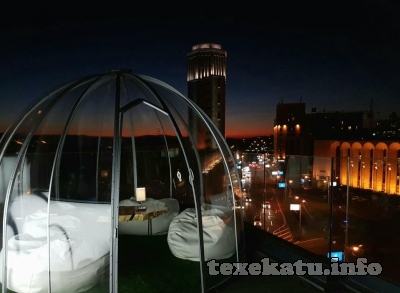 Located on the 7th floor of Yerevan Plaza business center EL Sky Bar has a breathtaking panoramic view over the capital of Armenia. It offers two zones: main hall with balcony and seasonal open-air rooftop. Here you can attend thematic parties, organized nearly every Friday and Saturday, where DJ creates an atmosphere charged with energy, transforming the space into a party place, listen to live music performances or just relax in a friendly atmosphere. Gourmets can enjoy fantastic gastronomic menu from Continental cuisine and a wide variety of alcoholic drinks or cocktails. For seafood lovers our chef offers uniquely presented sushi and snacks. Exquisite service and warm, relaxed ambiance make it the perfect place for just about any occasion including weddings, private parties, meetings or corporate events with indoor/outdoor space. Have a delicate dinner with a glass of good wine or enjoy one of our cocktails, prepared specially for you.